The revolutionary socialist as democratic philosopher. (Review of "The Gramscian Moment"). Feminism: back by popular demand! Work Programme: government builds on New Labour "welfare reform"
On 13 June NHS Future Forum, the body overseeing the government’s “listening exercise” on health service reforms reported and recommended changes to the government Bill. Most of the recommended changes are cosmetic. The Forum recommends that Public Health England (the body which will give advice to the new GP consortia, and to the government) should be an independent body, taken out of government control, and that all organisations involved in NHS care or the use of NHS funds should be “subject to ... high standards of public openness and accountability”. Betty Tibakawa is a young lesbian from Uganda who fled to the UK, because in her own country she was violently attacked because of her sexuality. Three men abducted her, kicked her in the stomach, and branded her inner thighs with hot irons. Her injuries were so severe she could not leave her home for two months. The UK immigration system wants to send her back to Uganda where they say she is “not at risk of harm”. More than 8,600 claims were substantiated, in a survey covering 80% of councils. So probably 10,000-plus vulnerable adults have been abused over a six month period — that’s 55 adults a day. A quarter of the claims involved adults with learning disabilities, and another quarter people aged 85 or over. Dave Prentis, general secretary of the big public sector union Unison has announced plans to ballot the union’s members for strikes against the government’s pension cuts. Prentis first made that declaration on May Day, and has now repeated it in the run-up to Unison’s local government and general conferences, to be held in Manchester on 19-24 June. Over one hundred refuse collectors are on a two-week long strike in Southampton, which will end on 22 June. Street cleaners are on a one-week long strike, which started on 13 June. At the same time, traffic wardens have been refusing to collect parking fines — at a cost to the council of £100,000. 150 social workers are currently on a work to rule, and on the 13th, Itchen Bridge workers refused to collect tolls. Hospital cleaners from Southampton General, working for the contractor Medirest, were also striking. 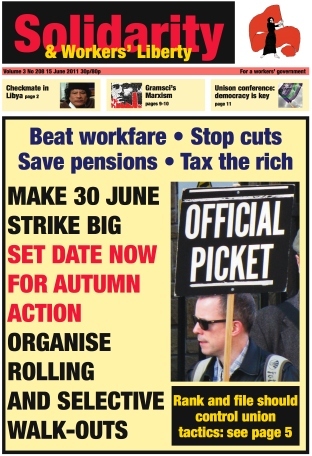 Planned strikes by London postal workers are in limbo as of 13 June, with the postal workers’ union CWU still closeted in talks with Royal Mail bosses. On 23 May the CWU announced that 79% of members voting from workplaces in London facing total or partial closure had backed strikes. Royal Mail wants to close Twelvetrees Lane mail centre in East London and Nine Elms mail centre in South West London, sharply scale down the big Mount Pleasant centre in Islington, and close the Rathbone Place delivery office just off Oxford Street. Staff at the University of Sheffield took part in a second strike over proposed changes to their pension scheme on 10 June, following a strike on 3 June. Staff, including administration workers, cleaners, caterers, porters and security guards took part in the second strike after negotiations collapsed during a meeting with the management on 9 June. The university had failed to rectify the damaging proposals to end the final salary scheme for the workers, who would instead receive “an inferior cash balance scheme”. On 26 May, London Underground cleaners’ rep Clara Osagiede beat back Initial Cleaning Services’ attempt to victimise her for enforcing standards of safety for cleaners at her workplace, her role as a health and safety rep.
She stood up to management when a group of cleaners were removing graffiti from trains without appropriate equipment or training. A few days later, she was suspended from work. Posh universities will probably not be much hurt by the new £9,000 student tuition fees. Enough people will take on enough debt to keep them flush. But universities at the other end of the “market” face worse. London Met University has gone for lower fees and huge cuts in courses, so to “position” itself as a good cheap alternative for a limited range of courses.